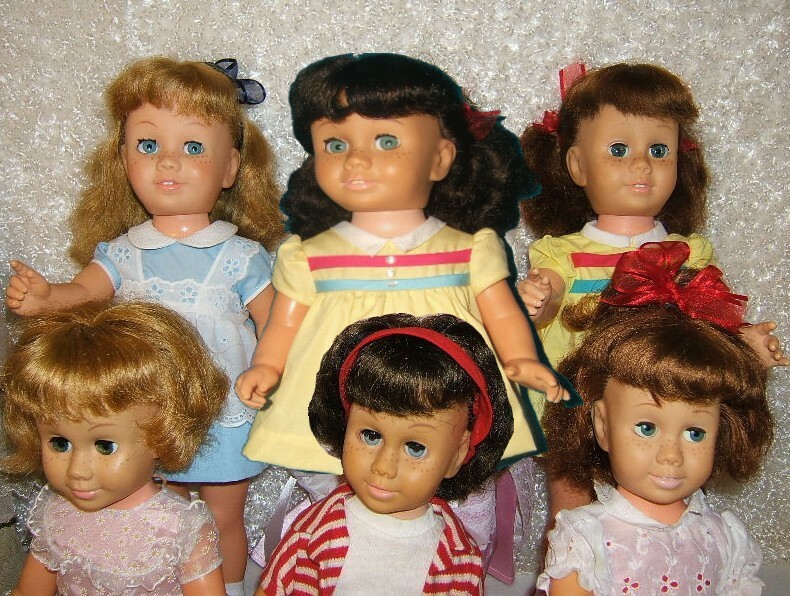 (above) A Mix of American and Canadian Pigtail Dolls, "From Left to Right"
"Top Row": ABlondePH, CBlondePS, ARedheadPS, CRedheadPS, ARedheadPH, CBrunettePS. "Bottom Row": ABlondePS, ABlondePS, ABrunettePS, ABlondePH, ABbrunettePS. in a list from high to low. Click Here. and head type is last "H or S". 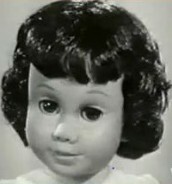 (Above) American Pigtail Dolls, Soft and Hard Heads. 3 soft heads in top row, followed by 3 hard heads bottom row. 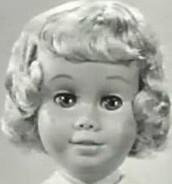 the glassine eyes in American Soft head and hard head dolls. 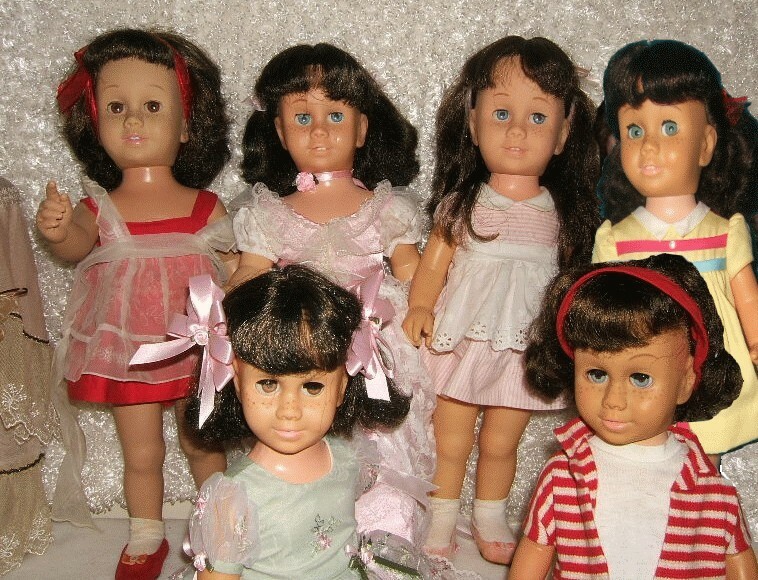 (above) American and Canadian Bob Dolls, "From Left to Right"
"Bottom Row": ABrunetteB/PaigeBoyH, CBlondeBS, CBrunetteBS, CReheadBS. 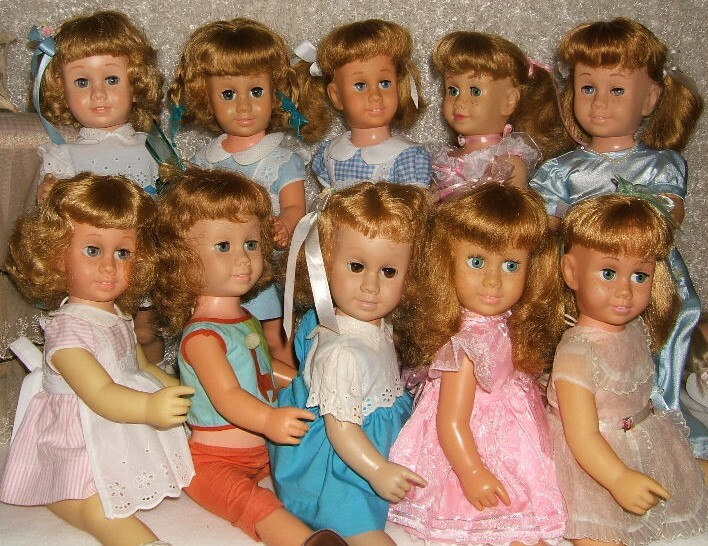 (above) All Blonde Dolls, American and Canadian, Bob & Pigtail "From Left to Right"
"Top Row": ABlondeBS, ABlondeBS, ABlondePH, ABlondePH, ABlondePS. 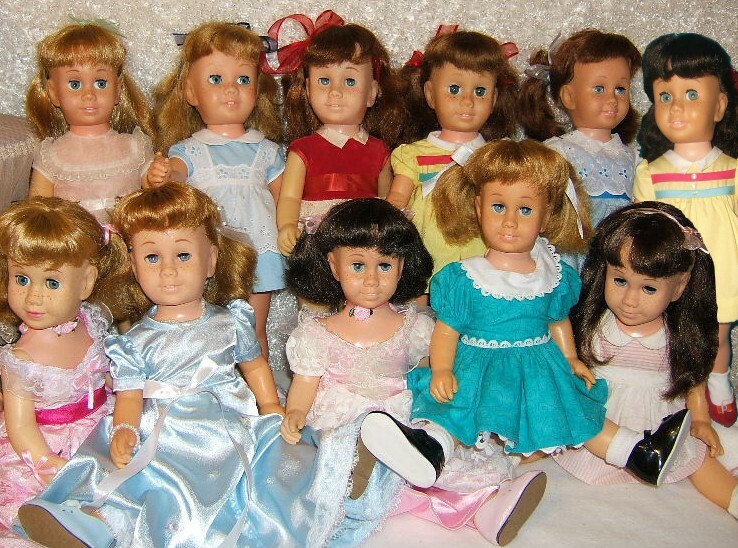 "Bottom Row": ABlondeB/PaigeBoyH, CBlondeBS, ABlondeBS, CBlondePS, ABlondePH..
(above) All Brunette Dolls, American and Canadian, Bob & Pigtail "From Left to Right"
"Top Row": ABrunetteBS, ABrunettePH, ABrunettePS, CBrunettePS. 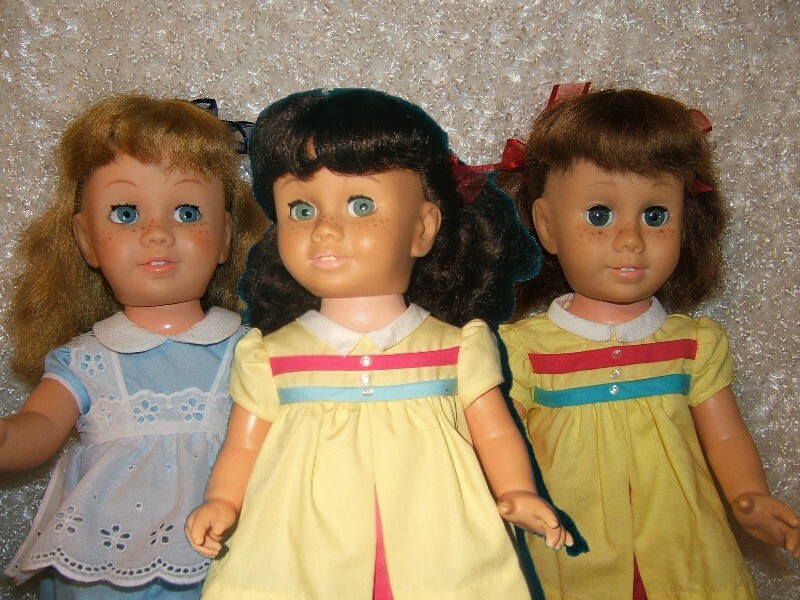 (above) All Redhead Dolls, American and Canadian, Bob & Pigtail "From Left to Right"
"First Row": CRedheadPS, CRedheadBS, ARedheadPS, ARedheadPH. is very unusual and should be on my Chatty Cathy eye page. (above) American Hard Head Bob & Pigtail "From Left to Right"
"Top Row": ABlondePH, ABrunettePH, ARedheadPH. To Show The Glassine Eyes in a American Hard Head Doll. "From Left to Right"
"Bottom Row": ABlondeB/PaigeBoyH, ABrunetteB/PaigeBoyH ABlondePH. with blue decal eyes and a brunette bob soft head with blue decal eyes. 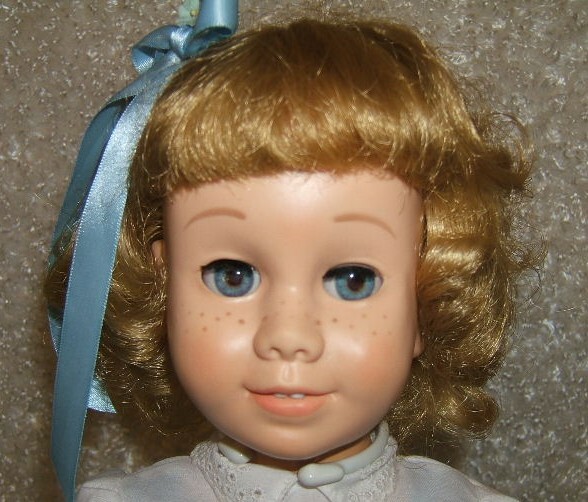 a blonde bob with brown decal eyes all soft head dolls. Brunette and Redhead dolls. Note: All Canadian Pigtail Dolls Have 2 Big Bald Spots On The back Of Their Heads. glassine or pinwheel eyes. Blonde Brunette and Redhead dolls. Glassine, Pinwheel and Decal eyes. To learn more about Chatty Cathy eyes please click here. pigtails but I have never seen her with the short bob hair cut. 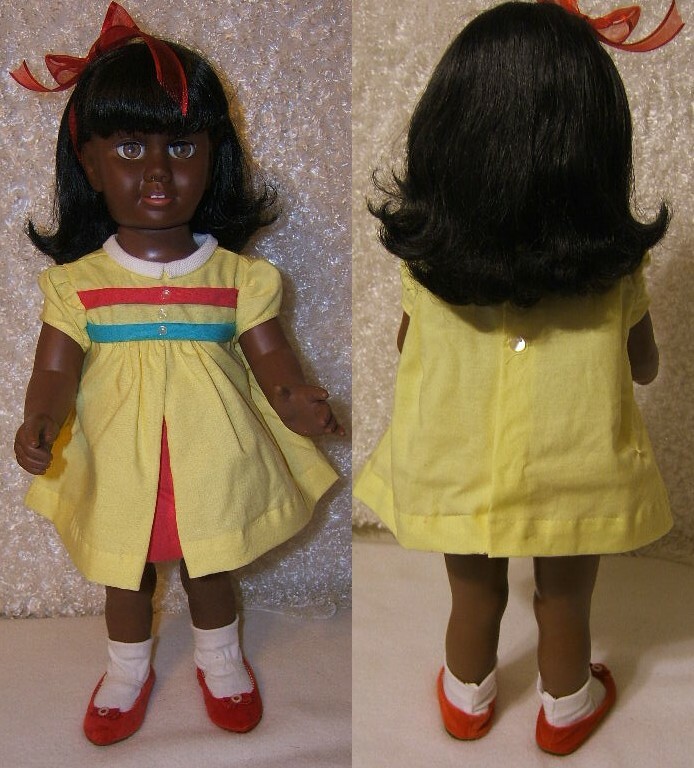 (above) Black American Chatty Cathy Doll Front and Back. that come with Paige Boy Hair Cuts all three are American Hard Head dolls. short hair and she is a Canadian Bob Soft Head.